DO YOU WANT THESE ADVANTAGES FOR YOUR HOLIDAYS WITHOUT EXTRA COST?. 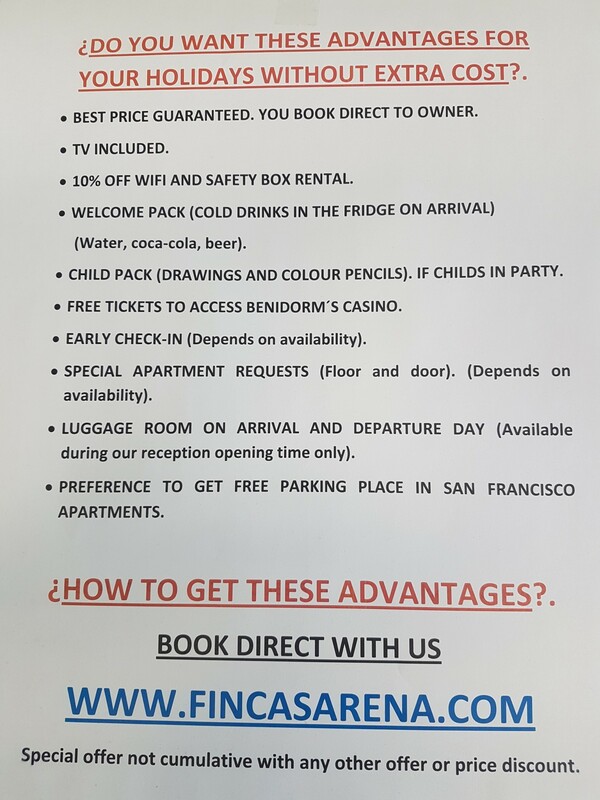 Advantages offered to our customers booking direct in our website www.fincasarena.com your apartment holidays in Benidorm. BEST PRICE GUARANTEED. YOU BOOK DIRECT TO OWNERS REPRESENTATIVE. 10% OFF ON WIFI AND SAFETY BOX RENTAL PRICE. 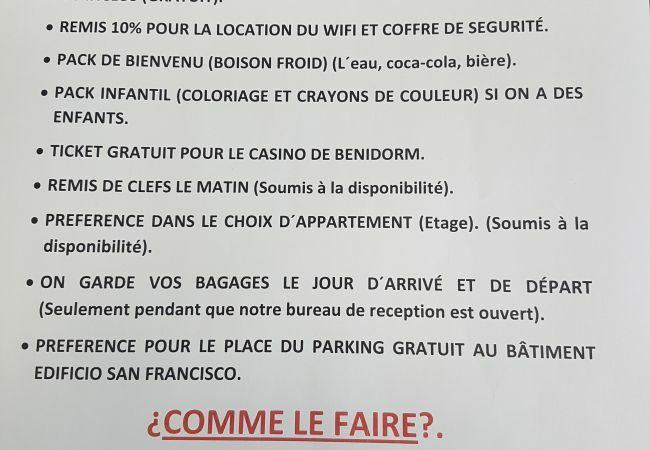 WELCOME PACK (COLD DRINKS IN THE FRIDGE ON ARRIVALBEBIDA FRIA EN LA NEVERA) (Water, coca-copa, beer). CHILD PACK (Drawings and colour pencils) if childs in party. FREE TICKETS TO ACCESS BENIDORM´S CASINO. EARLY CHECK-IN. (Depends on availability). SPECIAL APARTMENTS REQUEST (Floor and door). (Depends on availability). LUGGAGE ROOM ON ARRIVAL AND DEPARTURE DAY (Available service during our reception opening time only). ¿HOW TO GET THESE ADVANTAGES?. 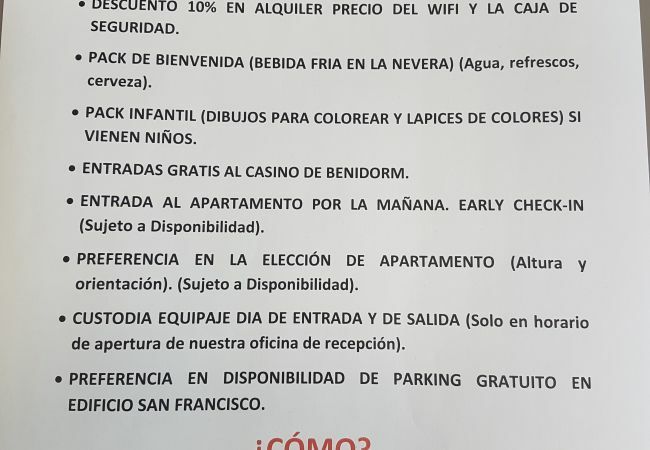 Fincas Arena wants to reward customers who year after year since 1.974 trust us to spend their holidays in apartments in Benidorm, so we offer the advantages indicated if they book directly on our website. Theese advantages will not be applicable in any case to reservations made through other reservation portals or websites that read information from our reservation system, due to it is a prize for clients that book directly in FINCAS ARENA and not through third parties. Here you are the list of advantages in more detail. In most of the apartments for rent on our website you will see that the TV is an extra service to be paid, but if you book directly this service you will get it equally but you will not have to pay for it even if the website indicates it. Another advantage to book on our website is that they will have an automatic discount of 10 % on the rental price of the WIFI service and the safe that is installed in most apartments regarding the rates indicated on our website. This discount will be applied in our office when paying this service. In this way we want to reward you for trusting us to hire your vacation, making it easier for you to enjoy more services and amenities in your apartment. 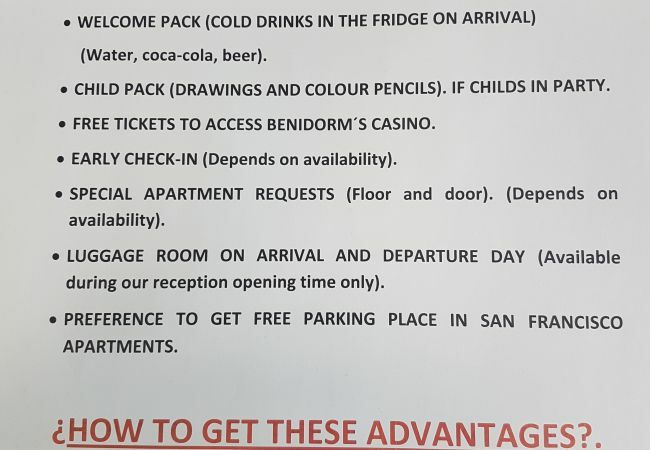 The Welcome Pack is an optional service that we have recently added to the list of improvements that can be booked when you book your apartment with us. This pack consists of a liter and a half of water bottle, cans of soda and beer for the adult occupants indicated in the reservation. They will be in the fridge upon arrival. For those bookings made by families on our website, we give them a package of colored pencils and coloring sheets, so that the little ones in the family have a small detail on our part. 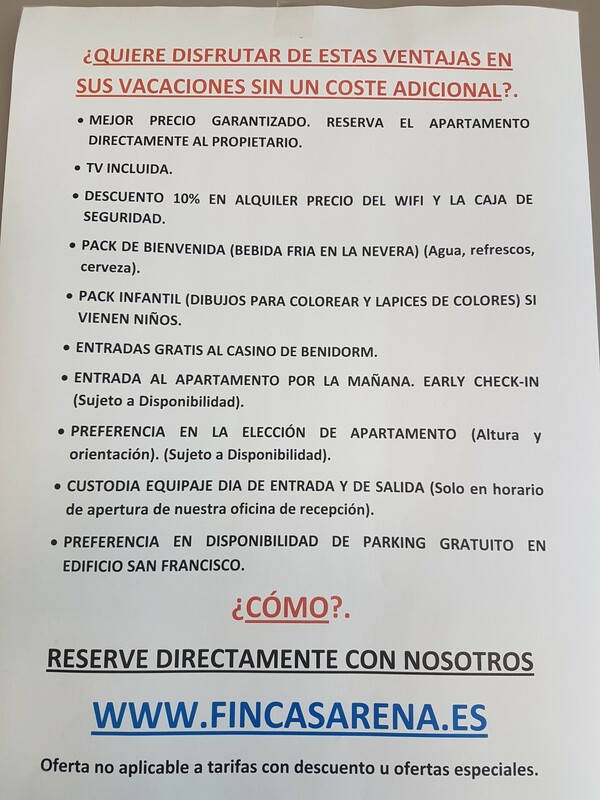 In some cases you will be in the apartment upon arrival and in others we will hand it to you in our office at the moment you go to do all the documentation of the reservation. 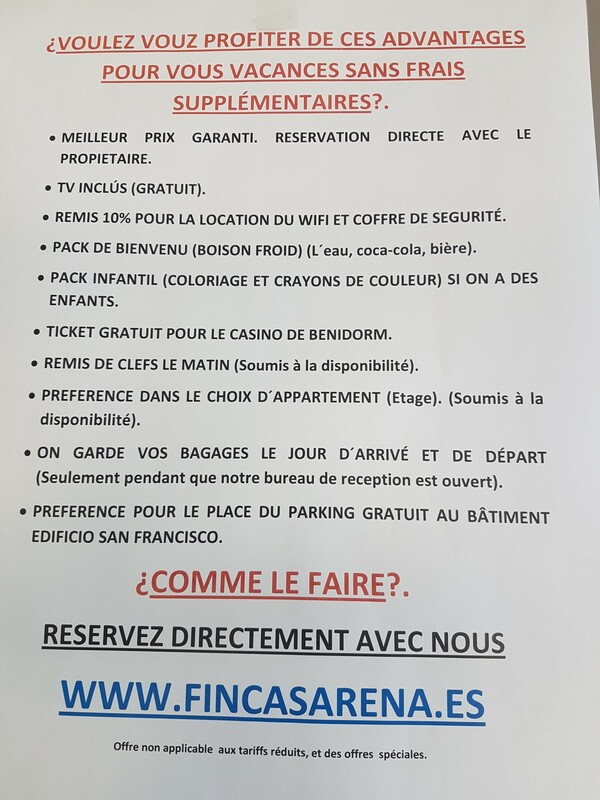 All clients over 18 years of age benefit from an agreement that Fincas Arena has with the Benidorm´s Casino, through which we give invitations to visit the casino with a free access, the normal cost of entry ticket is 6 € per person. Customers who have booked on our website, as an additional advantage, will have the option of entering the booked apartment in the morning whenever possible (subject to availability), ie the reserved apartment is clean and prepared. In the same way if you indicate us an arrival time in advance, we will try as far as possible to have your apartment ready with preference to other reservations that have not been done through our website. An additional advantage we offer to clients booking on our website is that requests for height and orientation of the apartment in each building will have preference over other reservations, whenever possible, as these requests are subject to availability, But always our direct customers will be the first beneficiaries if we can attend your request. LUGGAGE ROOM ON ARRIVAL AND DEPARTURE DAY . During your holidays the arrival and departure times of Benidorm may not always coincide with the hours at which your apartment will be prepared or the maximum time of stay in the same the day of departure. For this reason Fincas Arena can store your luggage in our office on the day of arrival until your apartment is ready to enter and also on the day of departure we can store your bags from the time you have to leave the apartment until you leave Benidorm. This service is only available during opening hours of our reception office in Av / Europa, 23. Holidays and Sundays will not be available, Saturdays only in the morning (in summer if we open on Saturday afternoon, will also be available) .